Has your child been in therapy for years? Has your child had a hard time mastering their pesky sounds? Do you feel that there is no light at the end of the tunnel for mastering misarticulated sounds? Do people misunderstand what your child is saying? Has this affected their self-confidence? Has it affected their school-work? Look no further – this software program is your answer! Read the article below to learn more about the Complete Speech Program and how MY COMPANY can help your child in the comfort of your OWN home! The American Speech and Hearing Association reports that roughly 6-8 million Americans have a language impairment. Thanks to a technology now available in Milton, that number may be shrinking. Robyn M. Drothler, M.ED CCC-SLP, a local Speech-Language Pathologist, has been using a new device called a SmartPalate with her clients. Drothler’s practice, Advantage Speech Therapy Services, is the first practice in Milton to introduce this technology. The SmartPalate is a custom mouthpiece and computer software that displays where a student’s tongue is touching the roof of their mouth during speech. Speech-Language Pathologists, including Drothler, then create custom “tongue targets” for the sound(s) the student is working to develop such as /r/, /l/ or /s/. The visual target allows the student to repeatedly practice the sound simply by matching their tongue with the respective target. SmartPalate technology, known as electropalatography, was developed by Dr. Samuel Fletcher, an industry recognized audiologist and speech-language pathologist in the mid 1950’s. For decades, the use of the technology was limited to research facilities, primarily with speech students who were deaf or had hearing impairment. 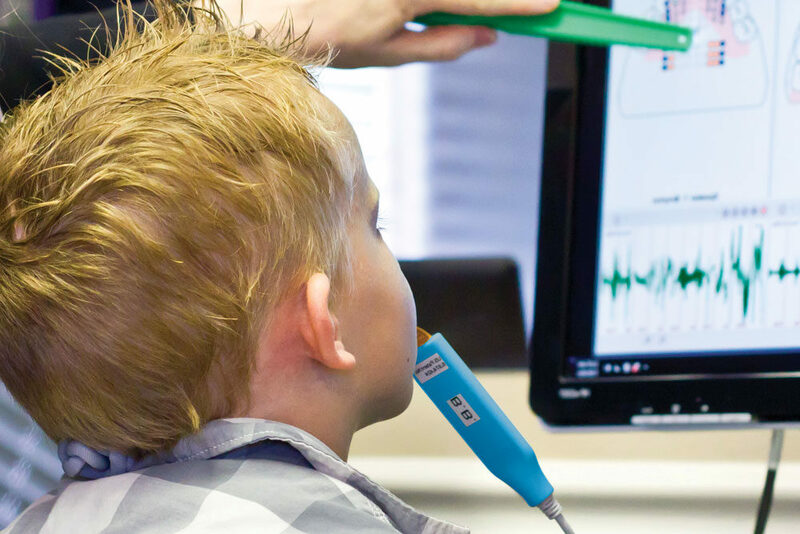 In 2010, a system was developed by CompleteSpeech for commercial use and Speech-language Pathologists have continually expanded the use of the technology to students with multiple speech disorders and backgrounds. In multiple cases, children, teens and adults who have struggled in speech therapy for years without significant progress have made immediate sizable improvements in their speech and consequently their self-esteem and confidence. Robyn M. Drothler M.ED CCC-SLP is a licensed Private Practice Speech-Language Pathologist in Georgia. She specializes in providing speech therapy services to children with varying disabilities including but not limited to: articulation, developmental delay, fluency, Autism, Down Syndrome, Cerebral Palsy, and expressive language delay. Ms. Drothler can be reached at 404-784-1252 and/or robyn@advantagespeech.com and is currently accepting new client applications. For product information, visit Complete Speech website. **This video shows you how the app can work on regular vowels – and it can also help with vocalic /r/ with an in app purchase**. CLICK HERE TO VISIT ASTS WEBSITE WHERE YOU CAN SEE OUR PRODUCT SECTION. Roswell, Alpharetta, Johns Creek, Milton….and surrounding areas.